I’ve been avoiding political stuff for the past several weeks but this one was too absurd to pass up. 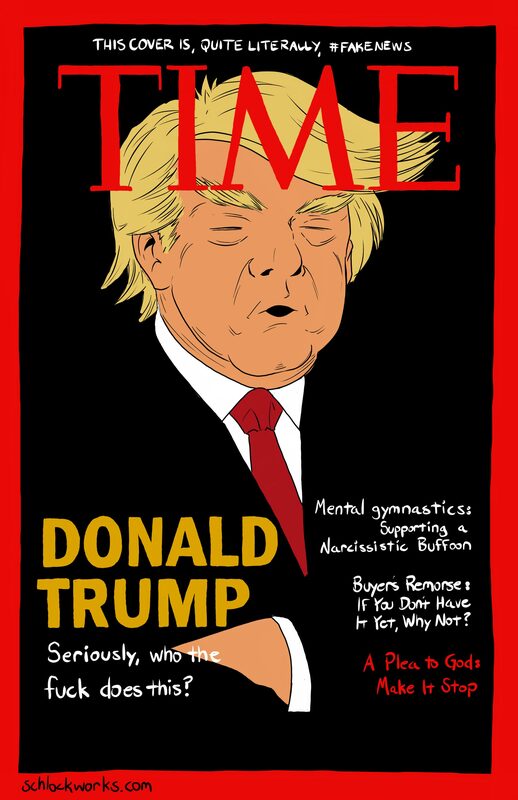 The President of the United States of America has fake Time magazine covers hanging in his hotels and resorts. Under the best of circumstances, this would be worth a few giggle and excessive eye-rolling. Given this guy’s track record, it’s just one more example of his rampant narcissism and desire to be the center of attention, deserved or not. If you support this man’s politics, I get it. I think his platform is short-sighted, vitriolic, unrealistic, and more than a little bit racist, but that’s politics. But how anyone can support the man himself is beyond me. His entire persona is based around the ideals we should reject in a President, not embrace. He’s petty, shallow, boastful, and the kind of guy most decent people would reject at a dinner party, not vote into the highest office in the country.